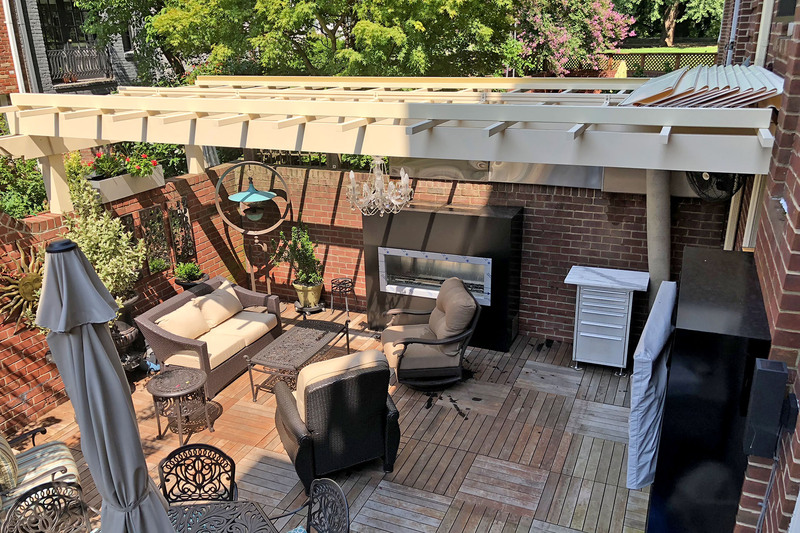 Champagne and chandeliers have always been a great match, and this outdoor retractable shade project is a great example of that pairing. 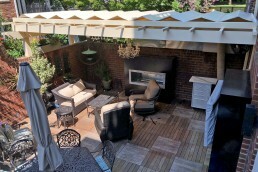 Making great use of the space, the homeowners had a custom pergola installed directly onto the red brick barrier. The area underneath is tastefully decorated with wicker furniture, cast iron tables and a sparkling chandelier. Although the space is protected by a great wall and lush green trees, the sun always managed to peek through. 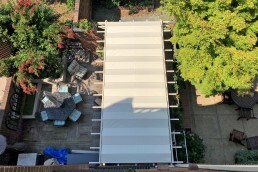 Desiring extra coverage for an upcoming party, Gail reached out to ShadeFX. “I generally never write reviews but ShadeFX so exceeded my expectations that I wanted to let everyone know. Generally trying to order something that is custom made online, can be a challenge. 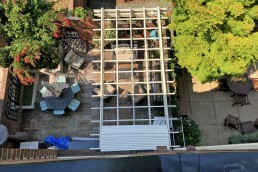 However, the team at ShadeFX were so professional and focused on details that I did not consider. I was comfortable with design process. 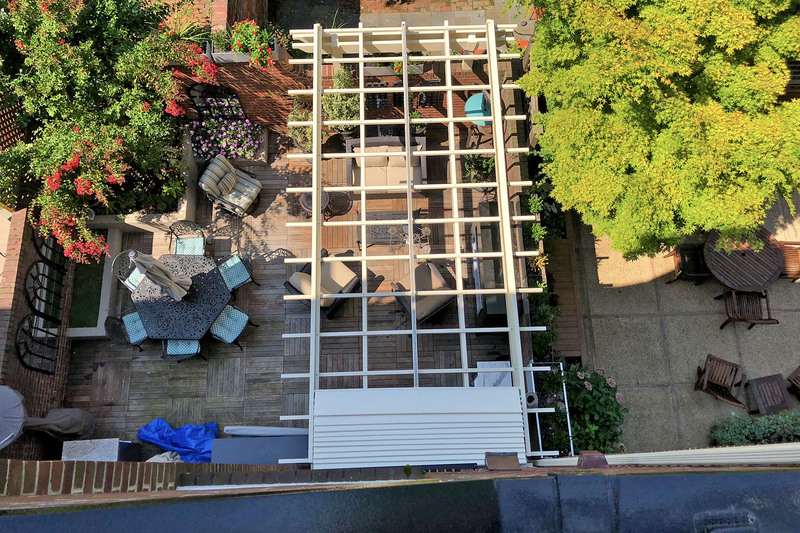 Now that the top-side canopy (in Ferrari fabric-Champagne) with custom powder-coated side rails to match the existing pergola has been installed, I am in love with our patio. 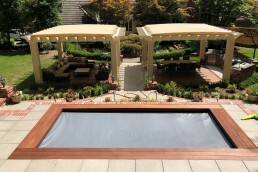 The entire team was easy to work with through the design process. In order to clear the elegant chandelier, fan and the glass French doors, Gail opted for a retractable roof. 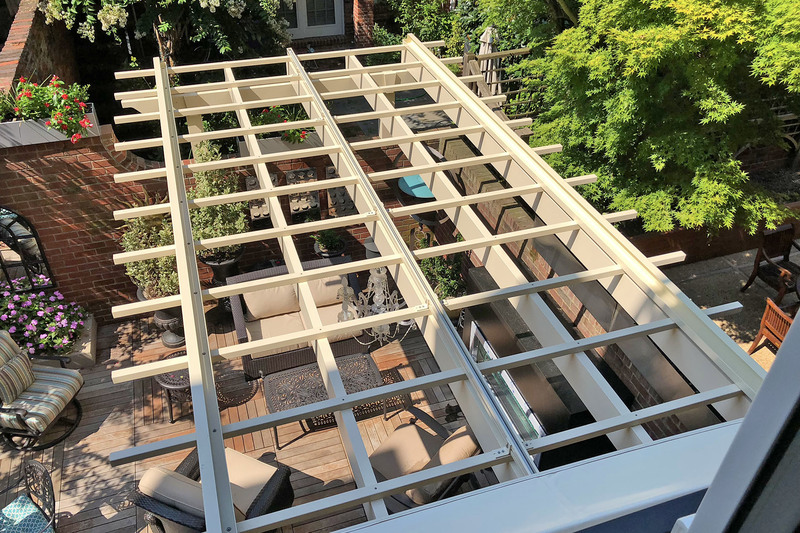 ShadeFX powder coated the track components to match the existing pergola, allowing it to seamlessly blend into the structure. 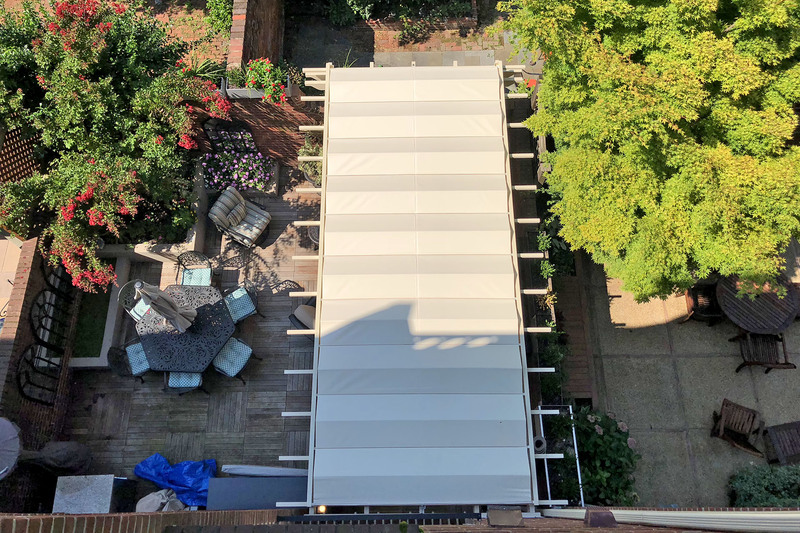 The service team travelled to Washington D.C and installed the 20’ x 8’ retractable shade. The long-term solution is fitted with a Ferrari fabric, appropriately named Champagne. 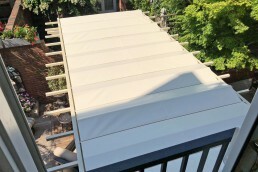 Not only does the retractable shade provide sun and rain protection, but it also gives privacy from the neighbor’s windows above. Whether it’s burgers out back, a buffet brunch or a garden party, this backyard will always have a subtle theme of champagne and chandeliers. 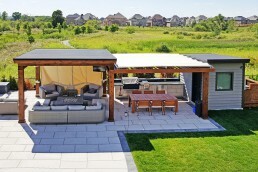 With the addition of the retractable shade, guests can RSVP to the party without reservations about the weather. 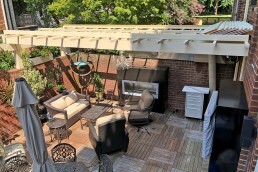 Retractable roofs mounts above and clears everything below. Learn more here. 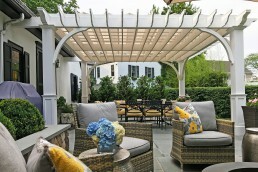 ShadeFX installed a custom 20’ x 8’ retractable roof on a light ivory pergola. The system components were powder coated to match the structure and a Champagne Ferrari fabric is used to protect the private parties.